Etymology: named in honor of William Kerr, who introduced the cultivar ' Pleniflora '. Origin: Japanese Kerria is not native to Japan, country where it was naturalized, but to China. Habitat: river banks, woods and mountain forests. Japanese Kerria contents itself with any soil, even calcareous, but drained, rather cool to a little dry. In terms of sunshine, it is tolerant (half-shade, sunny position). Height: 1,5 - 2 m tall. Shape: upright, shrub, teeming. The slender stems are arching and fall under the weight of tassels of flowers. They remain green. Deciduous foliage, leaves simple alternate. Flowers in April-May. They appear, as in the forsythia, before leaves. The blossoming of Kerria is abundant. Its flowers are in simple cut, of bright yellow colour. Variety with double flowers (Kerria japonica ' Pleniflora ') bears flowers with creased petals. 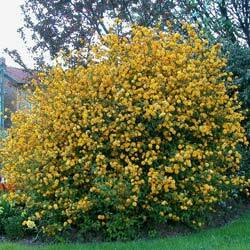 Use: Japanese Kerria is a nice hedge shrub. Its similar flowers in yellow bobbles make a nice shrub which it will be also possible to plant insulated or in group. Toxicity: leaves contain small amounts of hydrogen cyanide. In small quantities, it was shown that hydrogen cyanide stimulates respiration and improve digestion. It would also be beneficial in the treatment against cancer. However, in excess, it can cause respiratory problems leading to death. Propagation: Japanese Kerria suckers and it is enough to separate suckerses at the end of summer or autumn. Variety Kerria japonica ' Pleniflora ' is sterile, and can therefore propagate only by cutting or by weaning of suckerses. Varieties with double flowers are sterile. Advices of planting: Japanese Kerria can be planted in autumn or winter. Maintenance: remove suckers in surplus. Prune slightly after spring blossoming so that it produces new flowers in autumn.